You walked hand and hand with Gerald as the two of you ran across the parking lot. Gerald pulled you closer and spun you around making you giggle. How about we do a little recap, yeah? After you met Gerald in person for the very first time, you had grown closer. Gerald had started moving his schedule around so he could spend more time with you. You started listening to his music and got really into it. About a month ago Gerald popped at your door without an warning. He told you all about his upcoming tour and asked you if you would come along. Without an hesitation you agreed. It was currently week 3 of the tour, Gerald had just finished a show a few hours ago and you were off to the next state. Gerald let go of your waist and continued walking, you reached down lacing your fingers together and you walked towards to plane. "What&apos;s crazy?" You smiled turning around and facing him. "Just about a year ago I called some poor girl up around 2 am and rambled on about how fucked up I was. It&apos;s crazy that that same girl who answered my drunk call would end up touring the world with me as my best friend." He sighed pulling you closer to him and wrapping his arms around you. "I get it." You said into his chest. "Who would have thought some stranger was gonna mean so much to me." "Honestly, I ca even begin to imagine how my life would be if I never met you, like you&apos;ve become such a normal part of it and it&apos;s insane to think one wrong number could a have prevented all of this from happening." Gerald huffed, tightening his grip on you. "Alright you two we gotta go." One of the crew yelled. "We&apos;re comin&apos;." Gerald yelled back. You let out a small laugh. Gerald played with your hands as he thought up what to say next. "Y/N?" He said looking into your eyes. "I like you, Like a lot." Gerald bite on his lip. "Like I said, I can&apos;t imagine how different things would be if you weren&apos;t around. Yeah, you&apos;re my bestfriend and all but I wanna be more." A blush crept upon your cheeks. 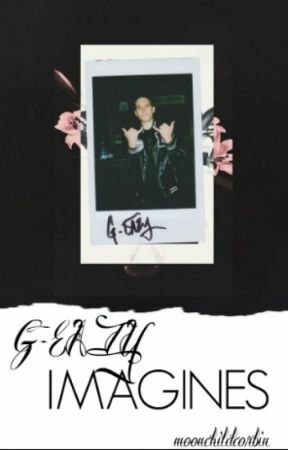 "Is G-Eazy asking me to be his girlfriend?" You laughed. "Yes. I&apos;ll be your girlfriend." You smiled, leaning up and kissing his cheek. "Okay, cool." He said rubbing your knuckles. "Let&apos;s go." He said intertwining your fingers and walking towards the plane.